Just in time in for the holidays to spoil your rats & dogs. Rat & Dog biscuits. All natural and vegan too. 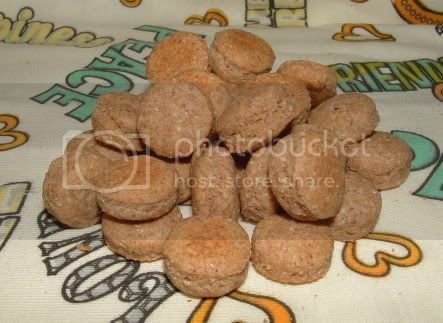 I've been making these for 5 years now and decided to sell them to my rattie friends Ingredients for both biscuits are Stone Ground Wheat Flour, Peanut Butter, Filtered Water & Baking Powder. The ones pictured below have chia seeds in them. Rat biscuits come in circles or hearts & run 3/4" in diameter. 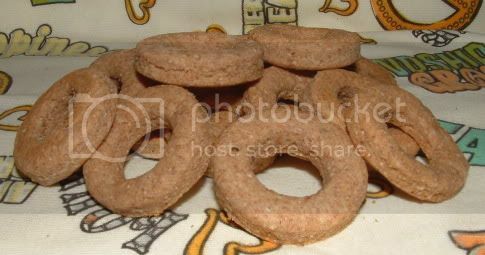 Dog biscuits come in the ring shape and measure almost 1 1/2" in diameter, but I will add more shapes soon. Flavors to choose from: Plain, Banana, Carrot & Apple. More coming soon! Mix in's: Cocoa Powder (rats only), Garlic, Turmeric, Organic Ginger, Cinnamon, Oatmeal,Organic Chia Seeds & Flax Seed. You can choose up to 2 Mix in's after that it's .25 per Mix in each. Will come packaged in a clear plastic bag with label & ingredients. These are made to order so you get them fresh! Have you tasted these? They sound yummy. I'm definitely going to be ordering, but have to wait for my paycheck to go in. I sent ya a PM if'in you're still makin' these. Got the treats! The girls love them, even the ones that hate most other treats... must be the Peanut Butter Crunch-like smell. But yeah, definitely a fine treat and I'll have to order more soon. Oh.... I personally love peanut butter, so I had to try one.... definitely needs sugar for human treats. You said the dog biscuits were vegan, right? Yes they are vegan, I can make them in bone shape too or rat shape if you like also. These treats are FANTASTIC. I got mine last week (gah, I should have posted earlier) and ALL 11 of my ratties love them. I've even been contemplating trying one because they smell so good. They're the perfect size for little ratties to hold, even my 2 month old baby, Holly can manage them. My boogerbutts just go crazy for them. And they arrived in no time at all and in perfect condition. I'm going to order more tomorrow. Really, you can't go wrong ordering these, they're great. I got my rat treats today. My rats like them. Thank you for adding a little more extra. These will last a while depending on how many I give my rats in a day. I'm now offering 16oz clear tight fitting clear containers for your treats. They will be $1 each if you would like one. My girls got their treats today and loved them. They were jonsing for more biscuits while they had to wait for the new order. Now I have happy babies again. wow!!! !..now I need to order rat treats sending you a PM!!! PIZZA! Dear god, my rats are going to go from addicted to absolute junkies on these treats after my next order. Do you have a variety pack? I would like to try some of every flavor!! !